Behavioral problems are a wide area to work in and from. Every dog, no matter what age, may have some type of behavioral problems. When an evaluator comes to your home, we ask a few simple questions to find out if there are any behaviors you wish to change. There is no extra fee if a behavior issue arises during our training course; we are already out there working so that new behavior issue will be worked on as well. What type of behavioral issues are you experiencing? Is your dog digging holes outside? Going through your waste receptacles? Jumping on furniture or counter tops? Running away if they get out of the front door? Pulling you every where on the leash? Chasing cars, skate boards, bicycles, joggers or anything that moves? 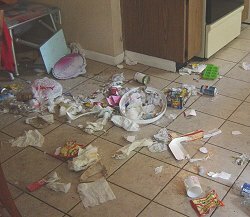 Since All American's training is done in your home, it enables us to get to the root of most of your dog's behavioral problems. We have found that most problems are legitimate survival skills on the dog's part, acted out in inappropriate environments. Correcting the dog for an incorrect behavior is a great place to start, but you need to be able to redirect the dog to do an activity for which you may praise your dog.